Interest in morel hunting has boomed in recent years, and if you hit the woods in search of these fungi you’ll find that competition is fierce. The hardest part is dedicating several days at a time to hunting them down, which most people simply can’t do. 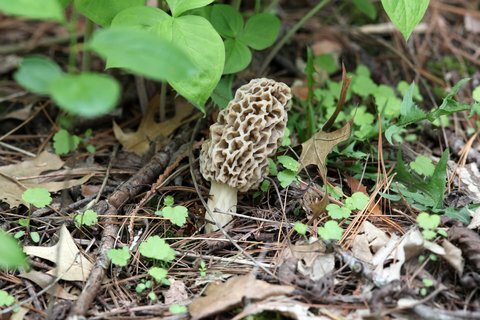 Even if you can’t take consecutive days off, there are a few tips you can keep in mind to ensure that your search for morel mushrooms still yields results. Keeping your eye on the upcoming weather is the first step in morel success. Morels begin to emerge when several different weather-related factors fall in line, like temperature, humidity, and soil acidity. When temperatures dip into the 40’s at night and the 60’s in the day, get your bag ready to go. Just because you found morels in one spot last season, it doesn’t mean you’ll have the same success the following season. To avoid missing out, it’s best to keep track of several locations where you’ve found morels throughout the years. Morels can be found in many different types of spots, but there are a few specific places where you’ll want to start your search. The best places are usually damp creek or river bottoms, around fallen, rotting timber, inside berry and rose brambles, and around trees that have just died. A pair of high quality binoculars can be useful for scouting potentially productive areas from afar. Doing so will allow you to cover a lot of ground without wearing out your boots, or keep you from having to search an area unnecessarily. One final tip for hunting morels is to always keep a good bag nearby. You never know when the opportunity to hunt morels may present itself, so keep a bag in your car, at your job, in your hiking backpack, or even in your tackle box. Woven mesh bags are ideal, like the ones oranges come in at the grocery store. Experienced morel hunters like them because they allow spores to fall from the morels you pick, seeding the area for the next season. previous articleHow Long Should You Fish a Spot Before Moving On?